Saturday marked Day 2 on the schedule for the 2012 World Poker Tour L.A. Poker Classic at the Commerce Casino, in Los Angeles, California. At the end of Day 1 on Friday, 523 players had registered for the event. Registration stayed open until the start of the second day and the field size grew to 549. When Day 2 was over, 182 remained and Gordon Vayo bagged up 284,000 in chips to claim the chip lead. 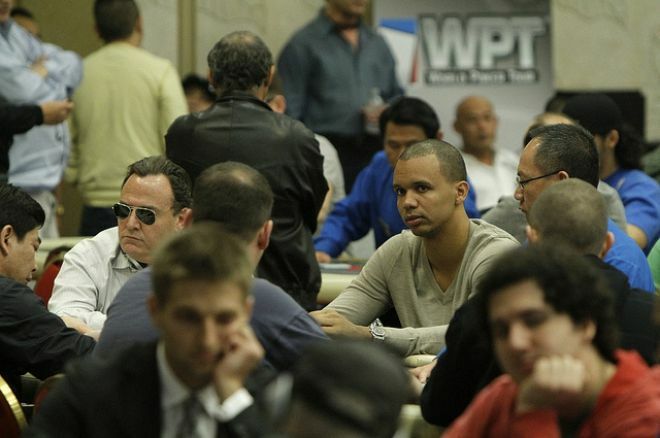 As mentioned in the first recap, Phil Ivey returned to play his first live tournament in the United States at this event. Once again, all eyes were on Ivey for Day 2, but not much happened in terms of overall chip movement. Ivey began the day with 116,300 and ended on 106,000. Still, the 2008 winner of the L.A. Poker Classic will enter Day 3 above average in chips and right in the thick of things. Scrolling through the end-of-day chip counts, nearly every player remaining is a notable in the poker world. Of course, there were quite a few who fell short of their goal and hit the rail on Day 2. Some of those players who were eliminated include Blair Hinkle, Mike Sowers, Jason Mercier, Allen Kessler, Tommy Vedes and the WPT's own Mike Sexton. The defending champion, Gregory Brooks also fell, after running his pocket tens into Nick Schulman's pocket jacks and opened up the door for a new winner this year. Greg Mueller was able to thrive on the day, going from just over 54,000 at the beginning of the day to finish on 279,700. One of the hands that netted Mueller some chips came when he eliminated Bryan Devonshire from the tournament. According to Devonshire's Twitter, his ran into Mueller's and that ended his tournament. For his successful day, Mueller earned the distinction as ClubWPT Player of the Day. Besides Vayo, Ivey, and Mueller, there's plenty of star power left in this field. In the top 25 alone some of the names include Keith Ferrera, Joe Tehan, Shaun Deeb, Sorel Mizzi, Dan Kelly, Jason Somerville and Gavin Griffin. A little bit further down the list are Billy Baxter, Dan O'Brien, Phil Hellmuth, Joe Hachem, Erick Lindgren and Chau Giang. Stephen Chidwick, Will “The Thrill” Failla and Amnon Filippi all ended the day with under 20,000 and will have their work cut out for them if they want to see themselves makes the money and score a deep run. Speaking of money, the prize pool was announced on Day 2 at the beginning of Level 7. According to the WPT Live Update Team, the total prize pool generated was $5,270,400. The top 54 spots will be paid out a minimum of $21,080. The top prize will be worth $1,370,240 and a $25,500 seat to the WPT World Championship at the end of the season in May. Day 3 will start on Sunday at 1200 PST (2000 GMT) with at least another five levels of play on the docket. WPT Tournament Director Matt Savage announced that a minimum of five levels will be played and that the field must get into the money. PokerNews will have the recap from play at conclusion. Get all the latest PokerNews updates on your social media outlets. Follow us on Twitter and like us on Facebook today!